A group of college students in Pennsylvania really want to lend you an arm in the near future. Or, to put it more accurately, they want to provide you with a way to increase the strength of your current arm. For their senior capstone project, 4 engineering students from the University of Pennsylvania decided they wanted to create something that would really help out their fellow men and women around the world. 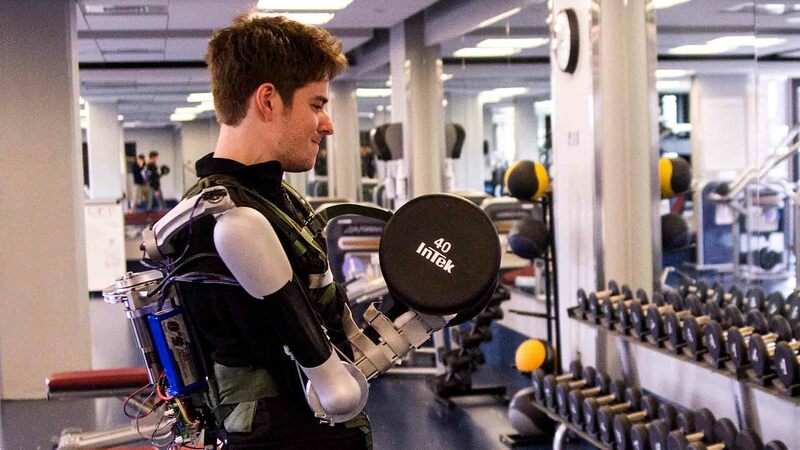 What they ended up creating is a wearable exoskeleton known as the Titan Arm that is connected to a backpack and attaches to your arm. Once attached to an arm, the Titan Arm automatically allows the wearer to lift 40 pounds more than usual. The student’s ultimate goal seems to be to help individuals who require rehabilitation, and to also assist individuals who have jobs that require them to lift heavy objects frequently throughout the day. Take a look below to see just what the Titan Arm looks like. The Future Of Physical Therapy? As you can see in the picture above, the Titan Arm looks fairly futuristic, and appears to be something that wouldn’t look too out of place on a cyborg. But this neat looking arm might just be part of the wave of the future. It has already taken home top honors in several contests and is currently garnering interest among potential users. Possibly the best feature of the Titan Arm is its price. It was created for less than $2,000 and is almost made completely out of aluminum. The students can see the day when its low cost will make it a staple in hospitals and rehabilitation centers. But the Titan Arm will surely come in handy in other places as well, such as the kitchen and the garage. After all, we could all use a little extra arm strength sometimes. It is unknown whether they are working on a dual arm prototype, but I for one certainly hope so.